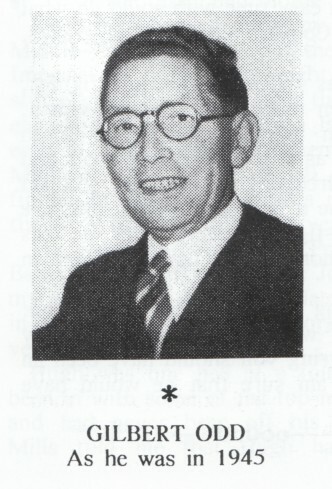 Gilbert Odd joined the staff of 'Boxing' in 1922 and was later the Editor of its successor, 'Boxing News'. He wrote numerous boxing-related books and was recognised as one of Britain’s leading boxing historians and boxing writers. He was inducted into the International Boxing Hall of Fame (IBHOF) in 1995 and died in 1996, aged 93. Running round the Southern Railway's sports track at Mitcham one evening, training for a coming quarter-mile, a young fellow asked me if he could join me. Company at such times is always welcome, but we did not talk until we were changing afterwards. He told me he was Jack Hall, lived in Thornton Heath, worked on the railway, and was a professional boxer. He started a friendship that lasted 60 years. We talked about my recent visits to the Crystal Palace, where I'd seen Frank Goddard knock out Billy Wells, Roland Todd outpoint Ted Moore, and Albert Jeal draw with Wal Jordon. 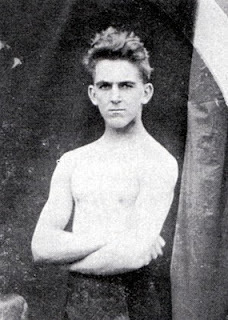 He told me he was periodically called upon to box in a minor bout at The Ring, Blackfriars, and invited me to his gym at Dennett Road, which turned out to be a loft over his father's stable. He encouraged me to pull on a pair of well-worn gloves and step into the single-roped ring. It was difficult to avoid falling through it as there was a large square hole in the middle, through which a ladder had been placed to get us aloft. "Can't it be covered?" I asked anxiously. He shook his head. "That's to sharpen up your footwork," he said, and there wasn't a glimmer of a smile on his sombre face. He put me through my paces while the other boys gazed in awe. I tried, he persevered, but after several patient sessions, we both knew it was no use. "I should concentrate on watching others do it," he said kindly. "There's a show Saturday night at the Comrades' Hall across the road. Marvin Hart will be topping the bill with Sonny Doke, and there'll be other Croydon boys fighting. It won't be as posh as the Crystal Palace, but you'll enjoy yourself." Half an hour before the boxing was due to begin I was there complete with pencil and note-book. Half a dollar was wanted for entrance if I wished to sit, eighteen-pence for standing. I said: "Press," and when asked what paper, I replied: "Sporting Life". He scratched his head. "We ain't never had a newspaper here before, but I'll fix you up with a card table and a chair at the ringside. Will that do?" I assured him that it would do nicely, and at this close range my first boxing report was written, while the ring shook under the energetic punch-swapping of the principal contestants. After ten bristling rounds a draw was announced, the MC telling the crowd they could show their approval with a nobbin’s, if they wished, and a shower of coins came in. Doing my job in the approved manner, I interviewed Marvin, he being the local lad. I said: "I thought you'd won," and he astonished me when he replied: "Oh, well, I'm boxing him again tomorrow night, so perhaps I'll win that one. If I don't, there's always Monday night, when we're having 15 rounds at the Blackfriars Ring." Those were the days. Thus friendships are formed. Years later, Jack was running a highly-successful haulage business, and was also high up in the antiques trade; Marvin owned a class colour-printing establishment and was driving a Rolls Royce, while I was editing Boxing News. Oh yes, I forgot to mention – Jack suggested I should send my version of the Comrades' Hall contest to Boxing (as it was known then). They not only published it in full, but gave me a very minor job on their staff, from which eventually I ascended. During a pleasant afternoon spent in the company of Gilbert Odd some years ago, he enlightened me on the reason that he began his career as a reporter and referee under the pseudonym of Neville Buckley. His father ran the family business of manufacturing cricket bats and had a strong passion for the game. Boxing, a working-man's sport, was hovering at the bottom of sports supported by Odd senior. Gilbert was already reporting fistic events for the trade paper and did so under that assumed name in order to avoid conflict at home. He never did take up a living in the family business, but cricket's loss was a very big gain for boxing. "They were two tough middleweights and what hard days they were. I worked all evening for half a guinea, but seeing the boxing was worth more than the money. I refereed many times at Caterham Barracks for Bill Goodwin and later officiated at the Croydon Stadium. My first job as third man was a baptism of fire. I took the easy way out and gave a draw when two local boys, with vociferous rival supporters, slugged it out to deafening cheers. The decision was applauded, and I was accepted into a life in boxing that has been so rewarding and wonderful." Some great article to see on boxing but also share something about Pakistani boxer Amir Khan. We have never seen any latest news about him, in fact, nothing about his career. ALso share this too. Jack Hall is my grandfather and I am extremely proud of this. Although now 52 yrs young and living in Indonesia I often think of him and named my youngest son 'Jack'. I miss you grandad and look forward to being with you again.